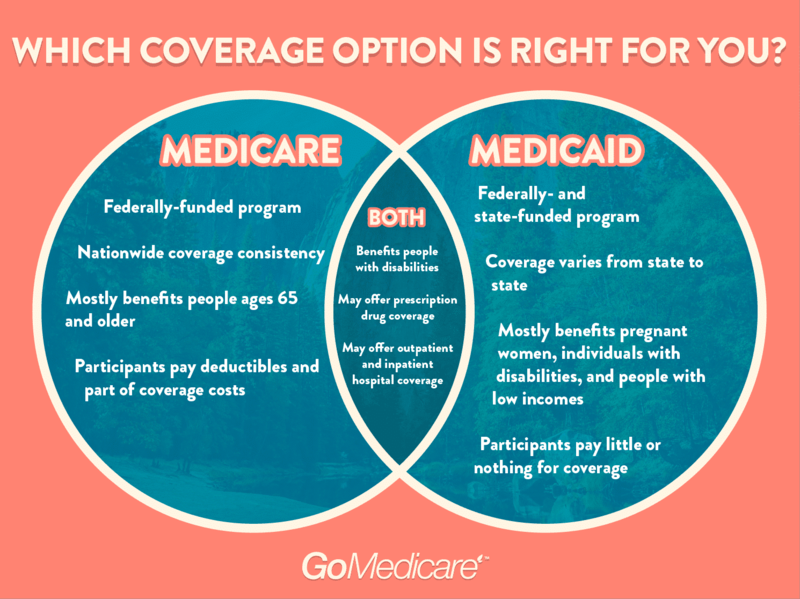 The words Medicare and Medicaid sound so similar, that the two are easily confused and interchanged. The differences are huge, and understanding how each insurance system works is the first step to making good decisions about your health care and finances. Medicare is the federal government’s insurance system that is funded with taxpayer dollars, co-pays from the patients and premiums from the patients. The only people who qualify for Medicare are elderly (age 65 and older), or younger people with a specific disability or kidney disease so severe that the patient requires dialysis or a kidney transplant. Basically, Medicare is for senior citizens. Each person on Medicare pays monthly premiums out of their social security income. There are different parts to Medicare. Part A covers hospital, in-home nursing and nursing home expenses. Part B covers doctors, outpatient procedures (when you don’t spend the night in the hospital) and some equipment for home use. Part D covers drugs and prescriptions. Part C is complicated, and usually run by private insurance companies. Part C helps “fill the gap” when Parts A and B won’t cover all expenses. Many people elect to shop around to buy a supplemental plan which covers extra expenses because Part C can be expensive and hard to understand. You will need to find an individual dental insurance plan, as Medicare will not cover the cost of routine dental work unless for very specific purposes. A supplemental Medicare plan from a private insurance company sometimes has dental coverage included for an extra charge. Likewise, Medicare will not pay for general vision screens or prescription glasses. Check supplemental plans for ophthalmologist and eye glasses benefits. To receive Medicare benefits, you can apply at your local social security office or online. Also, insurance agents can help you in person with deciding which supplemental plan would be best for your situation. You have a small window of time to enroll in their “open enrollment period” after your 65th birthday. If you miss this window, your premiums may increase. Other special circumstances and dates can also determine when this window of time closes. Medicaid free or very low-cost health insurance for people who are in a limited resources or who have low income. This is regulated by the federal government, but each state has different standards and rules, as well. Medicaid patients usually pay no money for their health insurance or their healthcare, aside from a very small co-pay. Dental and vision can also be included for children. Nearly 70 million Americans were enrolled in Medicaid in 2015. The federal government insists that many healthcare services be covered. The states then can determine what else they’d like to help the patient pay for. Standard medical care such as emergency room visits, hospitalizations, and nursing home care are covered. Other optional covered items include eyeglasses, dental work and case management, and these are decided on a state-by-state basis. You can sign up through the Health Insurance Marketplace or seek assistance from an insurance agent or case manager. Each state will have slightly different policies and regulations. The income level, also varies by state, and the Marketplace can place your case with a qualified agent to assist you. Some states also require a drug screen. In summary, Medicare and Medicaid are insurances that the federal and state governments provide to assist poor and elderly with their healthcare. Know which group you fit into and shop around for the best policies and agents to help you navigate these decisions.